This is a theme for medical websites. You can use it as a solid starting point for development of responsive WordPress sites related to medicine, medical services, healthy life and all other related topics. As we care about our health body condition, clinics and all other medical institutions should care about their online presence. It’s important because people who care about health and who sometimes need medical services thoroughly select clinics they would visit. As in all other aspects of life, selection could be done online. When a clinic’s website has been found and visited by a potential patient, its main purpose is to explain clinic’s services and practice, and also introduce doctors and medical staff who are employed there. 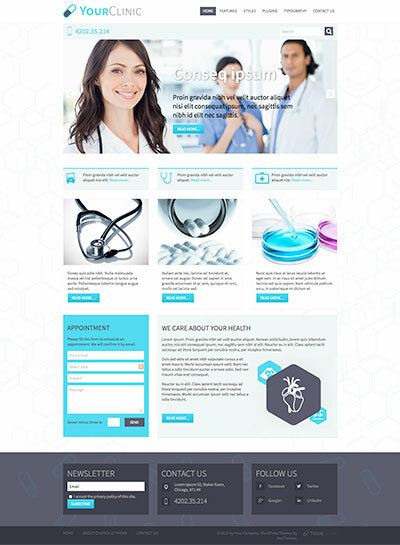 Hot Clinic is a medical WordPress theme for which we believe it could be used as a good starting point in development of a clinic’s website. It’s based on Sparky WordPress theme framework, the only framework which won’t make you feel « framed ». The framework allows you to easily control all aspects of the theme, including the layout. This theme is equipped with several plugins by HotThemes. The main role on the home page is given to Hot Full Carousel – Responsive Carousel WordPress plugin. Beside this plugin, the theme also includes WordPress slideshow plugin Hot Effects Rotator. It’s good to add precise map on the contact page, so we included WordPress Google maps plugin – Hot Maps. Finally, WordPress Lightbox plugin and Hot Gallery can be used for making photo presentations of the clinic. All these plugins are included for free (overall value $60) with this theme. Responsive theme based on valid XHTML/CSS code. 3 pre-defined styles with different main colors (blue, red and green) and different background images. Each color is easily customizable in Sparky options page (infinite color combination). Flexible and customizable layout powered by Sparky Framework for WordPress. Hot Full Carousel ($15 value), Hot Effects Rotator ($15 value), Hot Maps ($15 value), Hot Lightbox ($15 value) and Hot Gallery plugins are included with theme, pre-installed and configured. All commercial plugins are included with this theme for free! HotStart (SQL dump) is available with this theme. This installation method copies the theme with all plugins and demo content. You will get exactly the same site as our theme demo. 17 collapsible and responsive widget positions. Unlimited widget positions can be added easily within Sparky Framework, if you need more. Menu system with drop-down submenus. You can control all your menus through the framework. Tested with IE8+, Firefox, Chrome, Safari, Opera (on both Windows and Mac OS). Tested on iOS and Android mobile devices. Theme supports RTL (right-to-left) languages. A huge collection of typography elements that you can use as shortcodes is included.